Well, I absolutely loved this book. Loved it loved it loved it loved it. Actually, I should say that I loved Royce. It’s been a while since I’ve 100% latched on to a character. Matter of fact, I haven’t felt that way in 3 months. I’ve loved and really liked quite a few books since that one the kept me up at night, I’ve enjoyed stories and great adventures, I’ve felt close to a few characters, but none of the characters have consumed my mind in the past 3 months. This is both good and bad, which I’ll explain later (I feel a little silly about it…). Now, since I’ve latched on to a character, the story could take any turn and I won’t care, as long as I have my character. 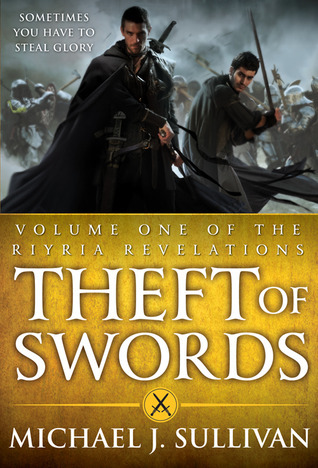 In Theft of Swords, if I didn’t have Royce, I still would have enjoyed it, but I wouldn’t have gone all character crazy like I am. It was a good story, with some wild fun. That said, I’m not one for political intrigue. I mean, I don’t mind it, I won’t avoid a story with it, but it’s got to have other stuff going on to keep me interested. This book did just that. The political sections of plotting and scheming and some POV’s had me reading faster, almost near skimming so I could return to Hadrian and Royce. Still, it ended just before I got into my, “I need to this to move faster” train of thought. So, all in all, the story was great. On to characters; my biggest weakness in a book. I’m going to admit something that I hope others can relate to, cause I feel a bit crazy when I do this. If I’ve latched on to a character, I mean, really latched on, I can’t stop thinking about the book and I MUST KNOW WHAT HAPPENS. Which means I’m useless until I finish the series. It eats away at me. I can’t sleep, cause I keep thinking about what I read. It’s entirely frustrating. I feel like a crazy person. There’s one series that I haven’t picked up the second book yet because the third and final installment isn’t done. Sadly, I’m afraid I’d go insane if I became much more invested in the character and didn’t have the final book in my hands. I’m not in jeopardy of that with these books, cause they’re all out. Yay me. Embarrassed, I admit that it seriously takes me like a week of horrible nights and absent minded days to move past a book if I’m hooked on a character. Heaven forbid anything happens to them. I go into mourning and I’m quite irritable. All that said, this book put me in that crazy, psycho mode. All the other books I had planned to read just got shelved. I. Must. Read. More. Royce. Soooo, I’m insanely obsessed now and have bought the next two books which I can hopefully read this weekend. Sigh… I had so many other plans. Oh well. Hadrian was also a great character, I have a feeling I’m going to start having the same problem with him in the next book. We’ll see. But right now, I can’t get enough Royce. The other characters were great as well, and I liked and hated some. Nice range. But I love myself a brooding, dark past character. Theft of Swords left me screaming in agony last night. It’s got a bit of a cliffhanger and drove me to lose countless hours of sleep. And I can’t read today, which I’m upset about, to put it very mildly. Hopefully, I can get far enough into the next book so I can get some sleep Friday night. I really hate this reading side to me. I get weird looks from my family whenever I try to explain it, but I can’t be the only one with this problem. Ugh!! So in conclusion, yeah, I guess you could say I liked this book. It’s been a while now since I read the Riyria Revelations. I felt the first one (the first story, I mean, each ‘book’ contains two stories) could have been a little better, but I loved the other five. Anyway, hopefully you’ll enjoy the other two books just as much. I agree. I like the second book better than the first. I’m in book 4 now and loving it still. I’m getting a little bored where I’m skimming some sections, but only a tiny bit. Royce still has me completely hooked.